Originally, the company this restaurant belongs to has been selling various kinds of Japanese pickles since 1940. This restaurant offers you unique but very creative Japanese pickles dishes. If you imagine “sushi”, I suppose that you have a picture of raw fish putting on the rice. However, instead of raw fish, this restaurant put various kinds of Japanese pickles! Depending on the Japanese pickles, the sushi gives you a different flavor and texture. If you want to try different kind of sushi, this is where you should visit! If you order this set meal, seven kinds of sushi would come along with miso soup and three kinds of Japanese pickles. Each one of the Japanese pickles sushi has a different taste as several kinds of vegetables are used on top. It is interesting to note that you don’t necessarily need to put soy sauce while regular sushi usually requires to put it. When you put the sushi in your mouth, the fresh flavor of Japanese pickle would fill your mouth and you may also enjoy the crunchy texture as you eat it. It was also the first time for me to have Japanese pickles tempura! For those who are not familiar with tempura, tempura is a deep fried foods coated with breadcrumbs. Normally, shrimps, vegetables such as sweet potatoes, pumpkins and eggplants are the main ingredients. However, this restaurant uses Japanese pickles as ingredients! It was very juicy but still crunchy texture that goes perfectly well with lemon coming along with this dish. Please also try some other kinds of Japanese pickles as you may find your favorite! If you think that Japanese pickles are all salty, this is what I would like to introduce to you! This Japanese pickle is an apple coated by sweet breadcrumbs. It was deep fried and put together with vanilla ice cream. What I loved the most was that the ice cream starts melting and soaked into the fried apple pickles. It became soft and even sweeter, so it was the best dessert after the Japanese pickles sushi! 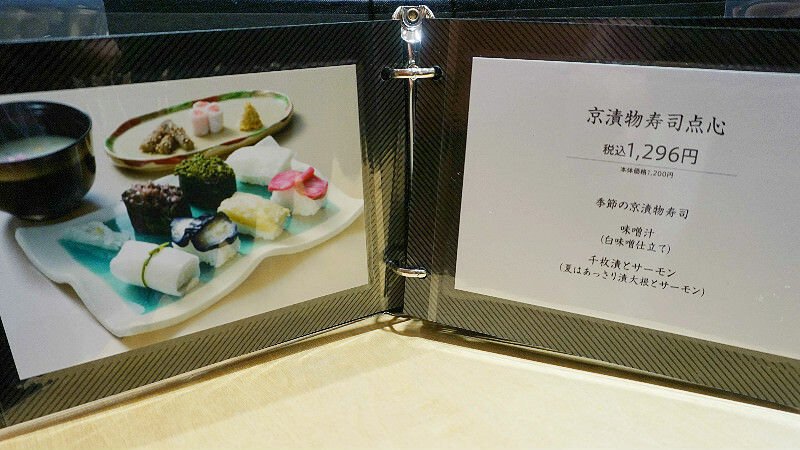 Although English menu is not available, pictures of each meal set are shown next to the menu, so it is easy to order and imagine what kinds of meal they would offer. When you have Japanese pickles sushi, you don’t need to put soy sauce as it already has a taste. It was the very first time for me to taste Japanese pickles sushi and tempura! First I was a bit suspicious about if it is tasty or not, but it was worth trying it. My favorite was Japanese pickles sushi as it gives a fresh flavor, and crunchy texture was quite enjoyable. As this restaurant is located in the Kyoto Station Building Shop Street The CUBE and very convenient to stop by, please visit and try Japanese pickles sushi and tempura! In B1F Kyoto Station Building Shop Street The CUBE, just near the central concourse of JR Kyoto station. 8:30am - 8pm Please note that you can order a set meal only from 11am to 7:15pm. They only offer drinks the time other than that. English menu is not available, but pictures of each meal set are shown on the menu.